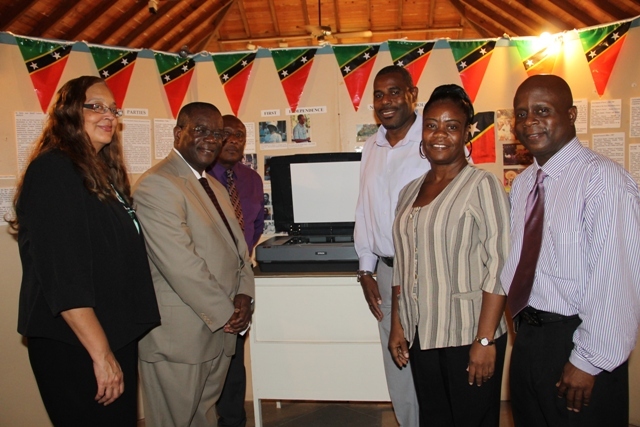 NIA CHARLESTOWN NEVIS (APRIL 15, 2016) — St. Kitts and Nevis Ambassador to the Organisation of American States (OAS) His Excellency Dr. Everson Hull, donated a state-of-the-art photo scanner to the Nevis Historical and Conservation Society (NHCS) on April 12, 2016, for use in its archiving. 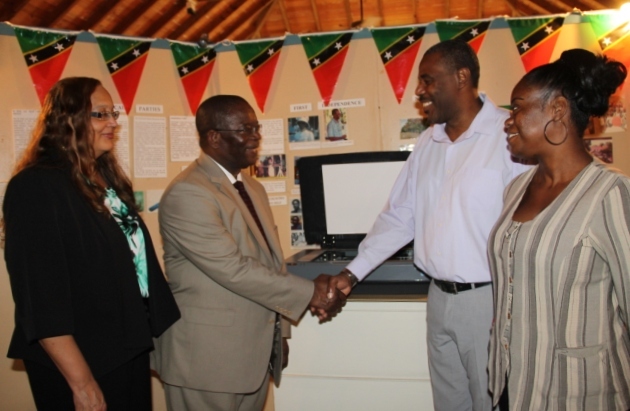 At a small handing over ceremony at the Museum of Nevis History at Bath Plain, Dr. Hall noted that his decision to purchase and donate the Epson Expression 11000XL photographic scanner came after visiting the Hamilton College in New York in February and saw one of the copiers at work. “I thought that it would be very nice if we had a system such as this on Nevis… and I decided that I would make the purchase and send it down here as quickly as possible. “I see this [scanner] as very important in terms of preserving the archives, preserving our very rich history particularly in the case of Alexander Hamilton… Americans are now becoming very interested in the history of Alexander Hamilton and there is a heightened awareness,” he said. 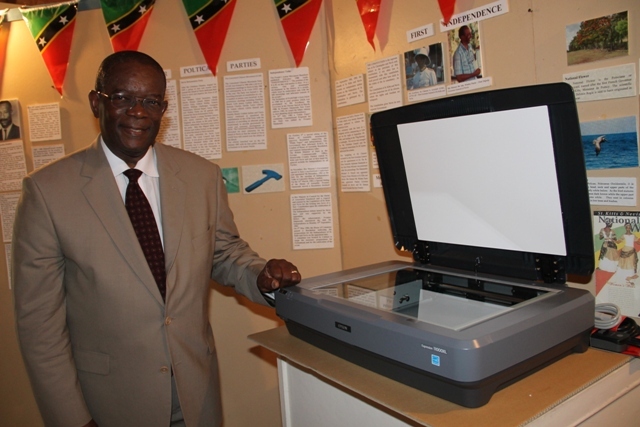 He expressed hope, that the unit would be used at both the Museum of Nevis History and Hamilton Museum for digitizing large manuscripts and for preservation of historical records. Devon Liburd who accepted the scanner on behalf of the NHCS, thanked Dr. Hull for the gift. He said it is an important and useful piece of equipment for their preservation purposes. He stated that the archive at the Museum of Nevis History is important to the NHCS and artefacts and documents were stored there. He noted that archived information is being preserved for future generations, however, it is at present also available to the public for research purposes. According to Liburd, technology is important for ease of access and the gift was a welcome one. Meantime, Permanent Secretary in the Ministry of Tourism Carl Williams who represented the Minister of Tourism Hon. Mark Brantley, said the gift was appropriate for the work of the NHCS. “This piece of equipment is very important. It is pivotal to their work and so we find it very timely and we are very glad for the generosity,” he said. Williams added that part of the Society’s mandate is to research and document the history of the island and to keep and maintain an archive and registered the Nevis Island Administration’s (NIA) gratitude to Dr. Hull for his continued commitment and support to the island of Nevis.